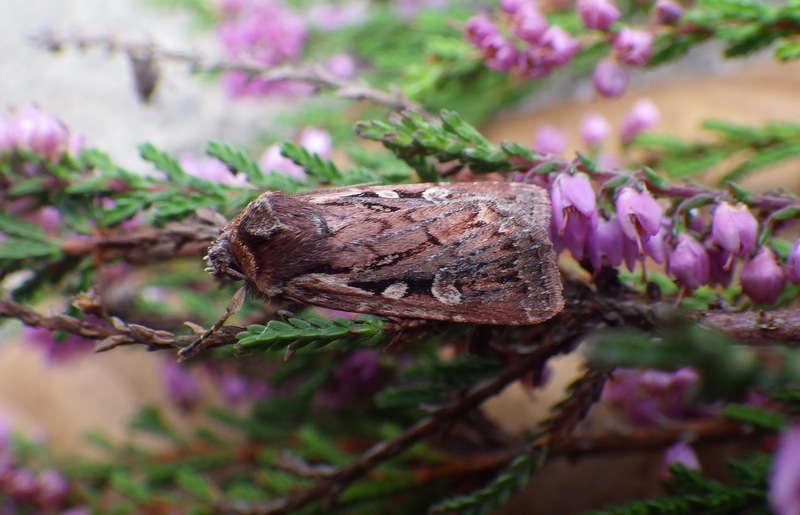 The weather last night (24/8) turned out rather clearer and cooler than anticipated with poor moth numbers and reduced variety in five traps (garden, another suburban Llanelli site and three around a small raised bog and woodland near Pont Abraham, Fforest). A bad sign (as it was this morning) was the no or very few moths outside the traps. The anticipated heath rustics were out at the bog site and a few other useful SN50 records were made in that comparatively under-recorded 10km square. The only migrant was a single rush veneer. Heath rustics together with Acleris caledoniana (see Sam`s earlier post) are both species that our more northern moth recorders may wish to usefully target at present. I`ll have a look at a couple of SE Carmarthenshire heaths for the Acleris tomorrow afternoon, but obviously the bulk of such habitat is in the north of the county. 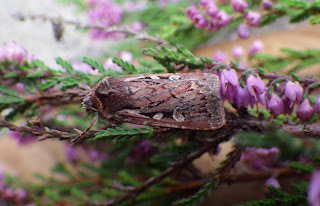 Above: heath rustic - about a dozen were caught in my actinic last night.